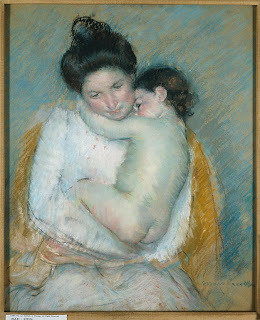 Like many of her works, this drawing by Mary Cassatt focuses on the subject of mother with child. Though the colors are somewhat complimentary, they are also muted, giving the piece a quiet and subdued feeling. The bright white of the woman's blouse helps to pull the figures forward in space, separated from the cool blue background by the contrasting orange chair, though the blue is also used extensively in the shadows that help to give the figures volume. Her use of color helps to create a circular path for the eye to follow starting at the woman's head, along her arm, and back up the other side. There is very little toward the edges of the piece, which keeps the viewer's attention focused completely on the subject. One of my favorite things about this piece is how line is used less as contour and more as a textural technique to build up the areas of color. It is the color more than the line that is used to define the different areas of the subject. Another thing I like is not knowing what the full story is to this piece. Because of the treatment of the cooler color and the ambiguity of the subjects' expressions, it is difficult to tell what their mood is. Very good "looking"; also consider how the pastel (I think it is technically a pastel, not a drawing) creates fields of color that allow the background to come through, making the picture airy and shimmery. Cassatt's specialty was women and children, usually mothers and their children, an acceptable and proper subject for a woman artist--yet Cassatt was herself neither married nor a mother, and she sort of cleverly "hid" her socially unconventional (hence dangerous) lifestyle behind the screen of respectability through her subjects.